Just got back from a week visiting the island of Madeira - a Portuguese island off the coast of Morocco, just north of the Canary Islands. About 33 degrees latitude, so about the same as San Diego, and it also has a similar climate - coastal, not too hot, but warm enough to appear semitropical. It used to be a big producer of sugar cane, and you still see sugar cane growing and being harvested in spots around the island, but the bigger crop now is bananas, which have become a big export crop. And of course vineyards, for the world-famous madeira wine. Since the climate is similar to coastal California, I was curious to see what trees were used in Funchal (the capital and largest city - really the only city of any size on the island). We were lucky to be able to stay at a hotel (Quinta da Casa Branca, if you ever go) that was formerly an estate owned by a guy who was obsessed about tropical trees - the entire 4 acre property was covered with spectacular and unusual tropical and semitropical trees, all of them with identifying plaques with scientific name, common name (in Portuguese and English) and location of origin. OK, so that might have had something to do with our choice of hotel. Once we got out into the city, the most spectacular trees were the African tulip trees (Spathodea campanulata) - all of them in bloom (we were there in early April). 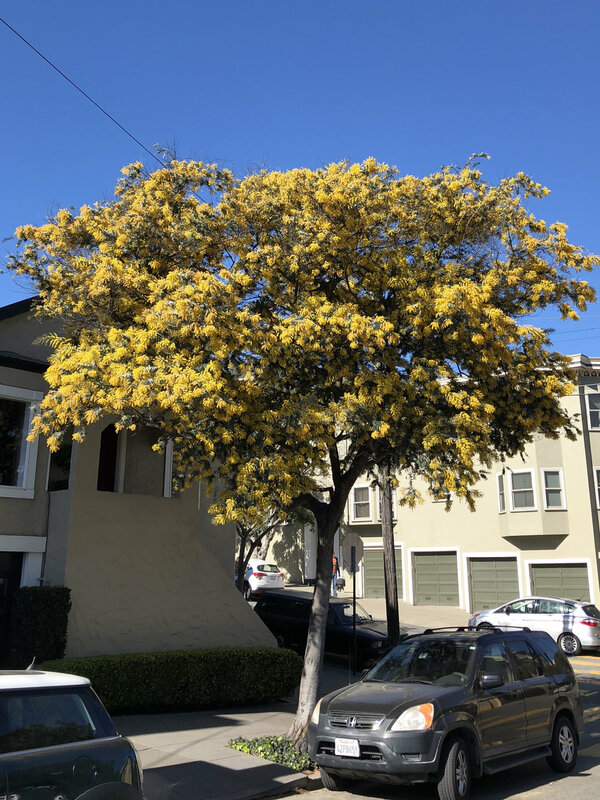 The tree is native to tropical Africa, and not all that well suited to our cooler Bay Area climate - not sure I have ever seen one in the Bay Area. The trees are amazing in bloom - football-size clusters of intense red-orange trumpet-shaped flowers. 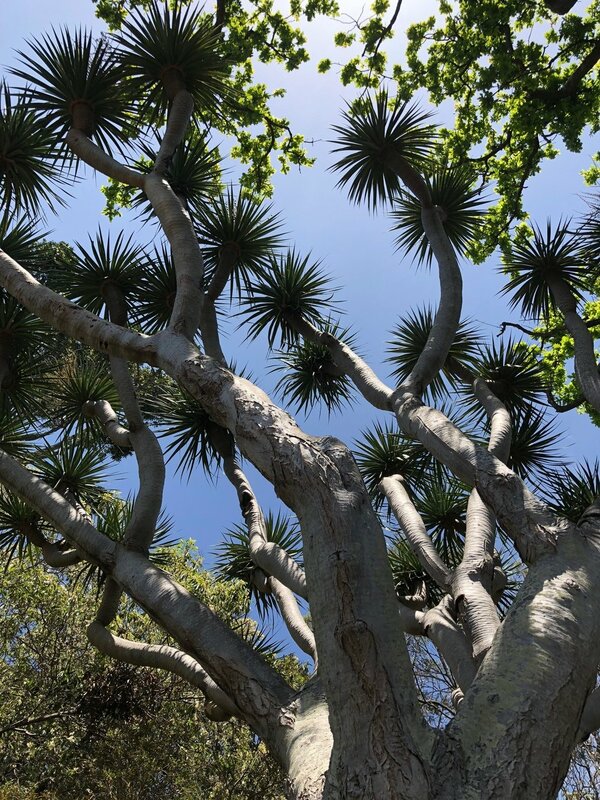 We saw lots of examples of Dracaena draco, the Canary Islands dragon tree. The tree is native to Madeira (and to the Canary Islands, Cape Verde and western Morocco), but we never saw any in the wild. 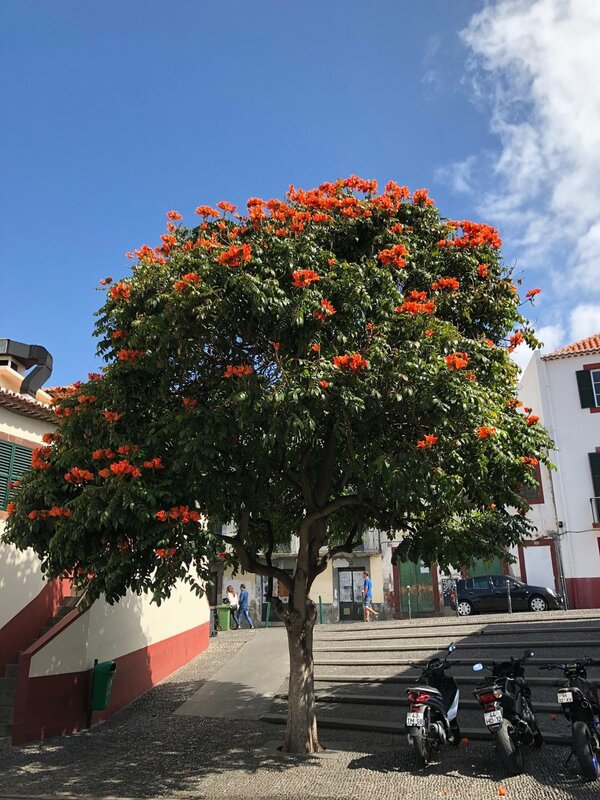 They were common in Funchal - perhaps evidence of some local pride in a native tree :-) Unlike most trees, dragon trees are monocots, related to palms and grasses. The largest example we saw was in Madeira's botanical garden (a real gem, by the way - not to be missed if you're visiting the island). One of the big tree-surprises in Funchal was that the city's principal street was Agathis robusta - the Queensland kauri - a tree in the Araucaria family from northern Australia, closely related to Agathis australis, the more famous kauri from New Zealand. 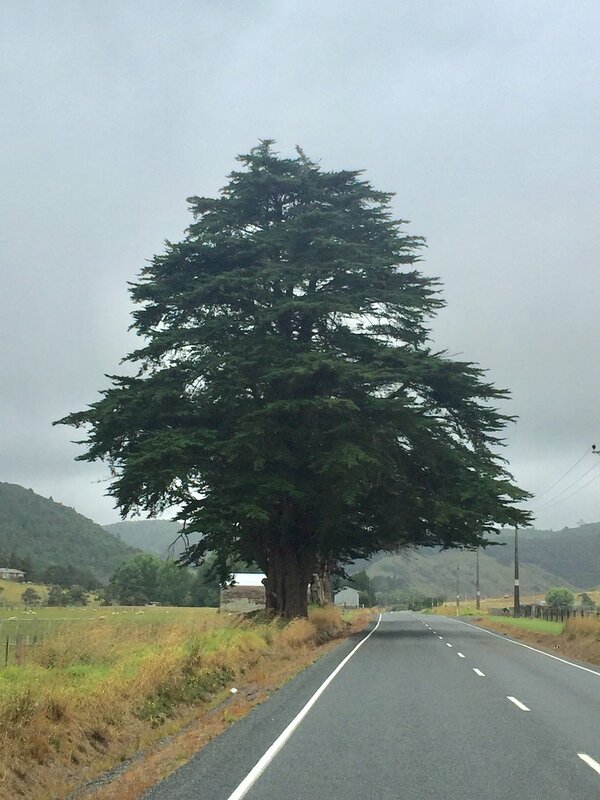 The trees were very erect/fastigiate - perhaps a variety that's been bred for that quality? I've never seen this species used as a street tree anywhere in the world, but they were very happy in Funchal. Maybe something to experiment with in similar California conditions? 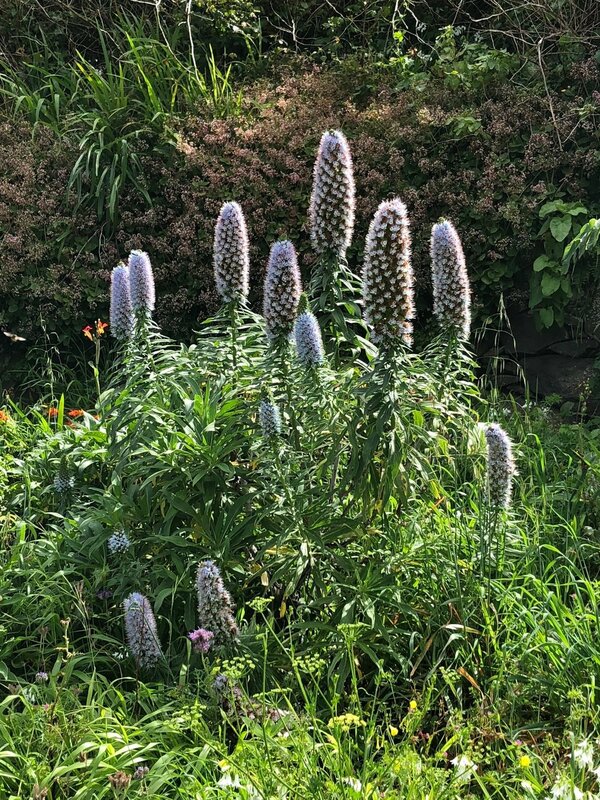 And, of course, there were pride of Madeira (Echium candicans). They weren't quite in season (surprisingly, since they're in full bloom in San Francisco). I know Trachycarpus fortunei (windmill palm) is one of the most cold-tolerant of palms, but I was still surprised to see a mature specimen in Paris, near Square Thomas Jefferson on the right bank of the Seine. Canary Islands dragon tree - rare sight in SF! I can't remember seeing one of these before in San Francisco. My husband took me this past weekend to his new favorite dog park (our dog Mather, named after the San Francisco Sierra camp, needed a run). It's a flat area in Corona Heights Park that you can access either from State Street or from Flint Street. (If you're approaching from Flint, walk past the tennis courts; if you came up the driveway from State Street, walk past the basketball courts.) You'll come to a dog park adjacent to some community garden plots. - and in between the two, this Dracaena draco - the common name is Canary Islands dragon tree. The plant (not really a tree - it's a monocot with a tree-like growth habit) is native to the Canary Islands, Madeira, Cape Verde and western Morocco. There's a beautiful example of this tree at the Hotel Coronado in San Diego; the two largest in California are both in the Santa Barbara area - one at the Sotto il Monte Estate in Montesito, and the second at Mount Calvary Monastery behind the Santa Barbara Mission. in Santa Barbara. But you don't see them often this far north. I'll actually be in Madeira in two weeks, and will update this with new photos if I see some! Acacias do put out a good amount of pollen, but the pollen is only mildly allergenic, and it's heavy, which means it exists only in the immediate vicinity of the trees. You're much more likely to suffer allergies from oaks, elms, pines, and and other wind-pollinated trees - the inconspicuous flowers of those trees don't get noticed, but they put out great quantities of lightweight pollen. Trees with colorful flowers aren't as likely to cause allergic reactions since the pollen is heavy and sticky (it's designed to stick to insect pollinators, who are attracted by the flower's color).